﻿PET tracer 18F-FDS effectively tracks the degree of bacterial infection and can better differentiate infection from inflammation than other tracers tested. RESTON, Va. – Researchers at the University of Louisville, Kentucky, have demonstrated that a new radiotracer, 2-18F-fluorodeoxysorbitol (18F-FDS), can identify and track bacterial infection in lungs better than current imaging methods and is able to differentiate bacterial infection from inflammation. The study is the featured basic science article in the January issue of The Journal of Nuclear Medicine. “Currently, bacterial infections can be diagnosed only after they have become systemic or have caused significant anatomical tissue damage, a stage at which they are challenging to treat owing to the high bacterial burden,” explains Chin K. Ng, PhD, at the University of Louisville School of Medicine, Louisville, Kentucky. For this study, mice were inoculated with either live Klebsiella pneumoniae bacteria to induce lung infection, or the dead form of the bacteria to induce inflammation. Half of the mice with the live bacteria were imaged with PET/CT using either 18F-FDS or 18F-FDG on days 0, 1, 2 and 3 to monitor disease progression post infection. The other half were screened by bioluminescent imaging, and mice with visible infection were selected for follow-up PET/CT scans with 18F-FDS. For the inflammation group, half the mice were imaged with PET/CT using 18F-FDS and half using 18F-FDG from day 1 to day 4 post-inoculation. While both 18F-FDS and 18F-FDG effectively tracked the degree of bacterial infection measured by bioluminescent optical imaging, only 18F-FDS was able to differentiate lung infection from lung inflammation. 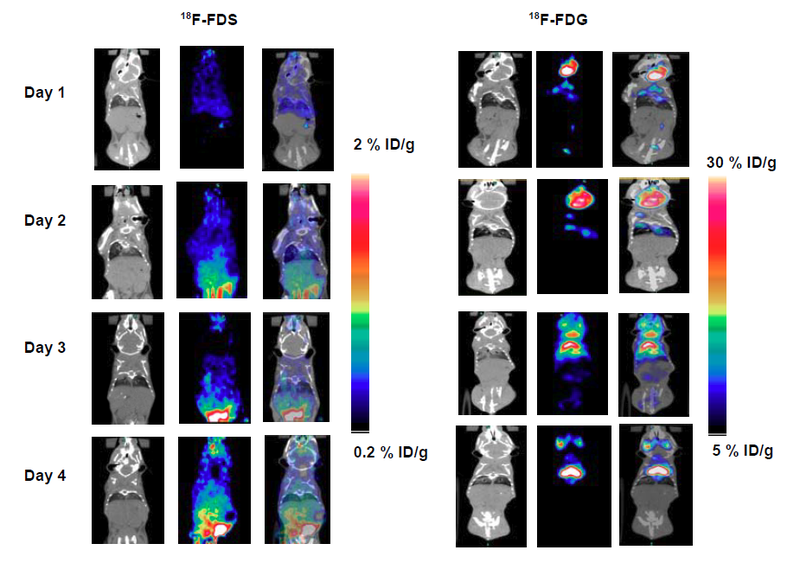 FIGURE: Representative PET/CT images of 18F-FDS and 18F-FDG in inflamed mice. Mice were inoculated with dead K. pneumoniae (10^8 CFU/mL). Imaging was performed for days 1, 2, 3 and 4 using 18F-FDG and 18F-FDS. CT images showed clear inflammation on day 2 and day 3 with corresponding high 18F-FDG uptake on PET. No significant uptake of 18F-FDS was detected for any of those 4 days. Credit: J Li et al., University of Louisville School of Medicine, Louisville, Ky. Authors of “Validation of 2-18F-fluorodeoxysorbitol (18F-FDS) as a potential radiopharmaceutical for imaging bacterial infection in the lung” include Junling Li, Huaiyu Zheng, Ramy Fodah, Jonathan M. Warawa, and Chin K. Ng of the University of Louisville School of Medicine, Louisville, Ky.